The annual Johnny Herbert Karting Challenge was held at the new Raceway Docklands last Sunday, November 26 – and the winning team of six featured no fewer than four sportscar / GT stars. Guy Smith, Chris Goodwin, Michael Vergers and Danny Watts were joined by 2006 Italian Formula Renault Champion Dani Clos and karting ace Jordan Oakes (third in Formula Renault Winter Cup). These six, running as Team Permaguard, won the event by just five seconds, after three hours of action. All the funds raised in this year’s event are going to the Warwickshire and Northamptonshire Air Ambulance. The winning crew qualified in sixth position, moved quickly up to third in the opening laps and then never dropped out of the top four for the whole event. As the first round of pit stops approached Team Permagard was in second position. Dropping to fourth following the stop, during the second stint the team consolidated second position then moved into the lead following the third pit stop. They held the lead with every driver change after that (each driver drives for two stints) – even though at one point they had to change karts after suffering a mechanical problem. 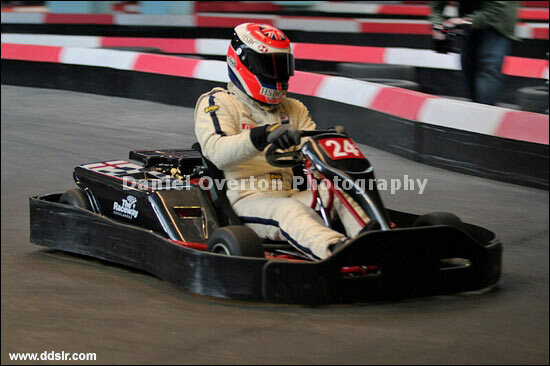 This is Johnny Herbert in action.